To provide insurance coverage and financial support to the farmers in the event of failure of any of the notified crop as a result of natural calamities, pests & diseases. To stabilise the income of farmers to ensure their continuance in farming. To encourage farmers to adopt innovative and modern agricultural practices. To ensure flow of credit to the agriculture sector. The existing State Level Co-ordination Committee on Crop Insurance (SLCCCI), SubCommittee to SLCCCI, District Level Monitoring Committee (DLMC) already overseeing the implementation & monitoring of the ongoing crop insurance schemes like National Agricultural Insurance Scheme (NAIS), Weather Based Crop Insurance Scheme(WBCIS), Modified National Agricultural Insurance Scheme(MNAIS) and Coconut Palm Insurance Scheme(CPIS) shall be responsible for proper management of the Scheme. IA shall be an active member of SLCCCI and District Level Monitoring Committee (DLMC) of the scheme. All farmers growing notified crops in a notified area during the season who have insurable interest in the crop are eligible. Farmers in the notified area who possess a Crop Loan account/KCC account (called as Loanee Farmers) to whom credit limit is sanctioned/renewed for the notified crop during the crop season. Such other farmers whom the Government may decide to include from time to time. VOLUNTARY COVERAGE: Voluntary coverage may be obtained by all farmers not covered in 7.1 above, including Crop KCC/Crop Loan Account holders whose credit limit is not renewed. 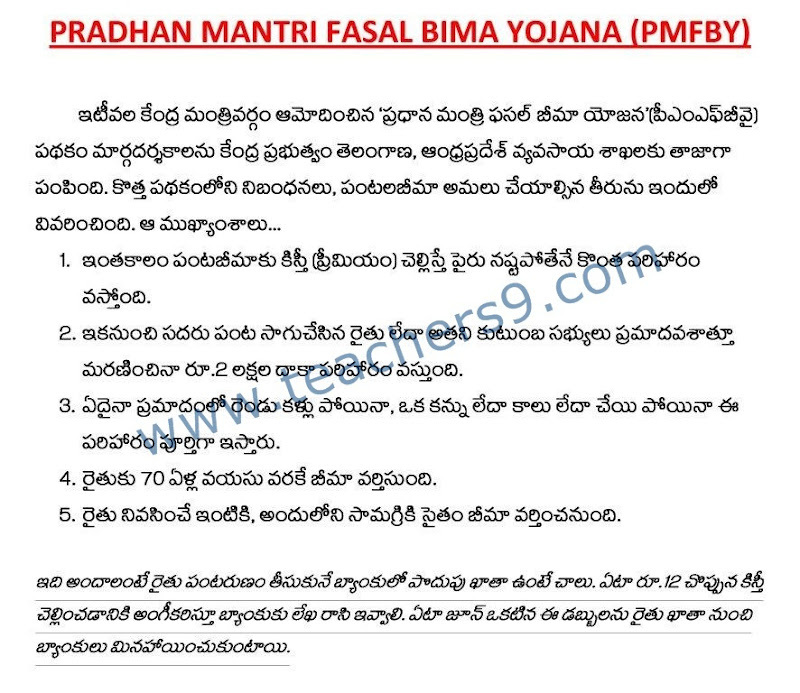 So finally the details of PRADHAN MANTRI FASAL BIMA YOJANA(PMFBY) scheme in telugu were given above. And you may go through the official website to get more details about PMFBY-PRADHAN MANTRI FASAL BIMA YOJANA scheme.